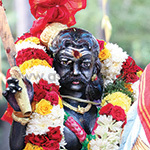 Karuppasamy is a powerful God endowed with immense wisdom and energy. He symbolizes the clouds, which empty their water on Earth and pave the way for clear skies, representing a happy and peaceful life. Deeply revered in rural areas, he is ever vigilant and stands as a guardian to the residents. The very embodiment of the combined powers of Kala Bhairava, Narasimha, Veerabhadra and Rudra, it is said that he answers the prayers of his devotees almost immediately. His propensity to drive away pain and sufferings endears him to his worshippers, and performing a Homa in his honor vanquishes the dark forces of evil, falsehood, and treachery from our surroundings. The benign energy of the Karuppasamy homa permeates your mental and spiritual being and can offer a protective shield against unfavorable factors that affect your health, wealth and happiness. 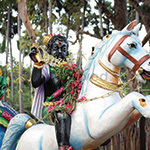 Archetype Karuppasamy is portrayed with a machete in his hands, mounted on a horse, which represents the divine speed of purpose. He is purported to be the upholder of dharma (righteousness) and manifests for the wellbeing of his worshippers, diminishing all hardships in life. 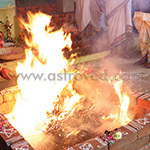 Performing the Fire Lab to appease Karuppasamy can bring about quick results and resolve problems with ease. This unique ritual can establish a divine connection with the deity and protect you from the evil eye, curses, black magic, jealousy or any other adverse effects. 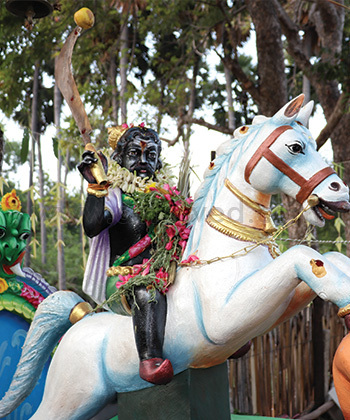 Karuppasamy is a fierce warrior and a righteous God, who comes to your rescue when you face problems in life. He is a god who can be approached when you are in distress for instant relief from your sorrow and destruction of any negative force around you. 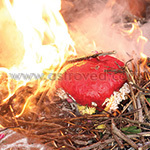 Performing Karuppasamy homa can thus grant you divine protection and help set right the problems in your life.